Brian Leavy, of Albuquerque, was pleased recently when he received a commemorative New Mexico gift set that included a state quarter and an engraved pocketknife. Opening the white box, he found its lid lined with a beautiful photo of a red sandstone formation, and emblazoned with NEW MEXICO, LAND OF ENCHANTMENT. 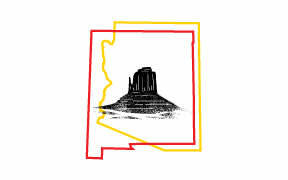 Leavy recognized the picture, of course, as the famous East Mitten Butte in Monument Valley, Arizona. UNM Law School professor Cliff Villa was heading home to Albuquerque after giving a guest lecture in Texas when he presented his boarding pass and New Mexico driver’s license to a TSA agent at the Houston airport. She looked at his documents, frowned, and asked if he had a passport. He assured her that he did but said it was safe at home. “She pulled out a heavy book full of pictures and began flipping through it,” Villa recalls. “When she walked away to confer with some colleagues, I glanced at the book. Reading upside down, I could see that it was opened to a page displaying identification cards from Nicaragua.” After delivering his second lecture of the day, the professor was allowed to pass. Yup, it&apos;s still Missing. Read more tales from readers. Send it to fifty@nmmagazine.com or Fifty, New Mexico Magazine, 495 Old Santa Fe Trail, Santa Fe, NM 87501. Include your name, hometown, and state. ¡Gracias!